Did I forget to tell you that I am leaving for China on Friday? I think I did. Well I am, rural, South Eastern China, and I am bringing Pia with me. It will be a whirlwind 5 day trip where we will be staying with my Parents on a farm outside of a town called Taishan. I am going to be speaking at an event about Women who turn their passions into careers, so I thought that there could be no better situation in which to bring my daughter. It’s never to young to be inspired, right?! I will do posts from over there, and I am excited to take lots of pictures of the region. In the mean time, I am trying to empty the house of fresh produce, or I will come home to a big fat rotten refrigerator. Pete and Coco will undoubtedly be eating out for each and every meal while we are gone, and I always feel bad about spoiling and wasting food. Tomatoes are one of my prime targets right now. We are in serious tomato season. Have you noticed? The techni-color gorgeous tomatoes at the store, the farmers market, maybe even your own garden. I love tomatoes, but to be honest, I have to think of all kinds of ways to use them up quickly enough, because I will never be that girl (I like to think of myself as a girl) that just pops a cherry tomato in my mouth. They need to be dressed up with salt, olive oil, basil, preferably cheese. Something. Isn’t that terrible? I can’t help it. I still get flashbacks to when my grandparents used to try and force me to eat them raw even though I said I didn’t like them. So it’s not my fault that I would then gag them back up onto the kitchen floor. But we can talk about that another time. Right now lets celebrate tomatoes (and the fact that I am not so traumatized that I can still enjoy them as an adult) in all their gorgeous glory. 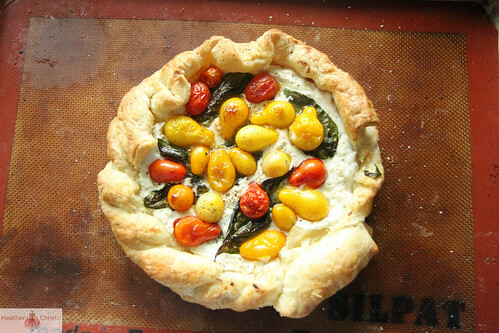 This kind of has all of my favorite tomato accompaniments involved: Cheese (ricotta to be specific), basil, olive oil, salt (obviously) and to really make things good- buttery puff pastry (my favorite cheater crust!). This will take you five minutes to make, another 20 to bake and viola! Elegant, delicious and beautiful. Preheat the oven to 425 degrees and prepare a sheet pan with a silpat or sheet of parchment. Lay out the sheet of puff pastry on the prepared sheet pan, and gently roll it out until it is about 1/3 larger in size than originally. 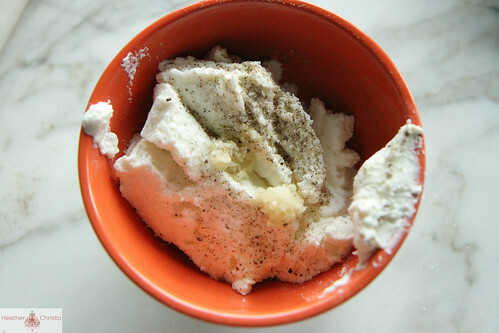 In a small bowl, mash together the ricotta, the garlic and some salt and pepper to taste. 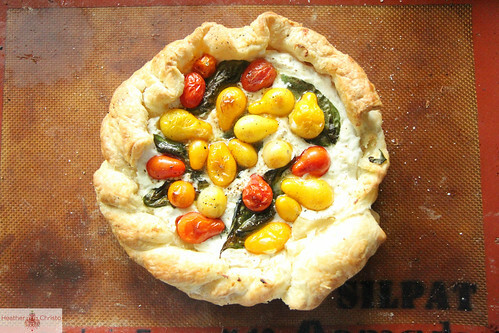 When the oven has come up to temperature, then gently spread the ricotta into the center of the puff pastry and lay the basil leaves on top of the ricotta cheese. 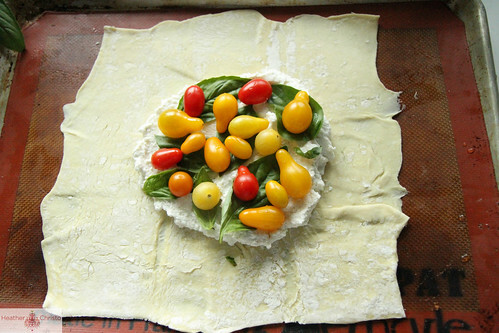 Then place the cherry tomatoes on top of the cheese and basil. 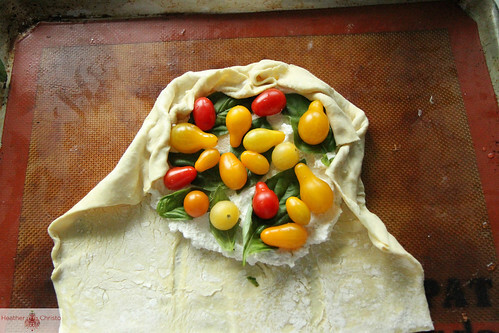 Fold the edges of the puff pastry up around the cheese and tomatoes. 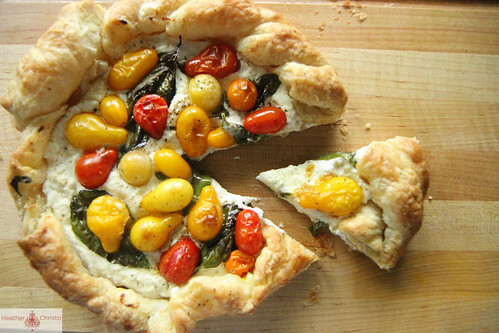 Drizzle everything with olive oil and sprinkle more salt and pepper over the crostata. Bake at 425 for 25-20 minutes or until golden brown. 1. Preheat the oven to 425 degrees and prepare a sheet pan with a silpat or sheet of parchment. 2. 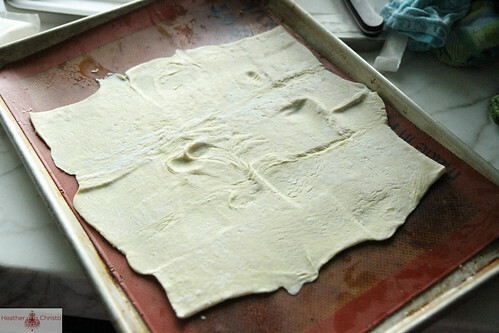 Lay out the sheet of puff pastry on the prepared sheet pan, and gently roll it out until it is about 1/3 larger in size than originally. 3. In a small bowl, mash together the ricotta, the garlic and some salt and pepper to taste. 4. 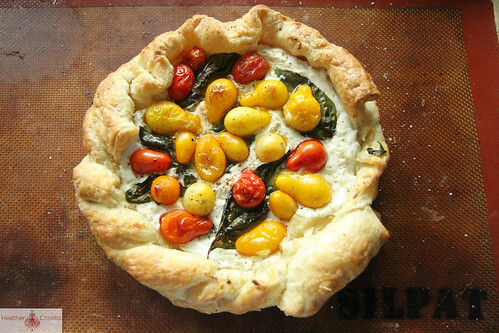 When the oven has come up to temperature, then gently spread the ricotta into the center of the puff pastry. 5. 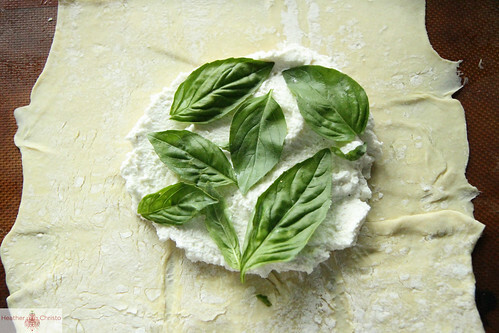 Lay the basil leaves on top of the ricotta cheese. 6. 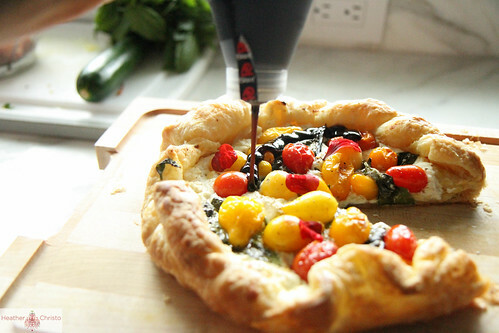 Then place the cherry tomatoes on top of the cheese and basil. 7. 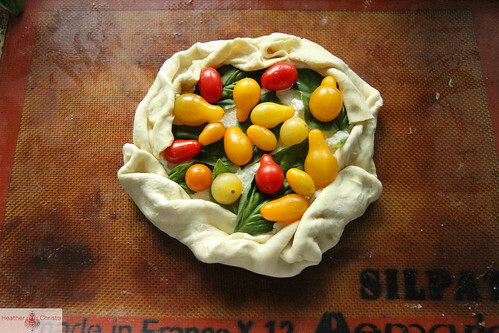 Fold the edges of the puff pastry up around the cheese and tomatoes. 8. 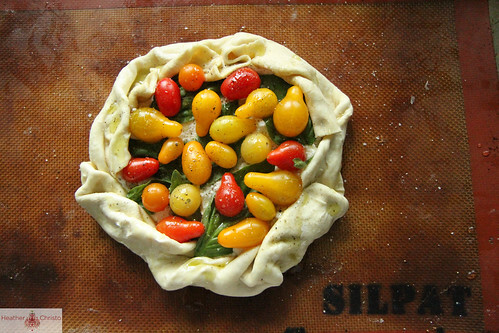 Drizzle everything with olive oil and sprinkle more salt over the crostata. 9. Bake at 425 for 25-20 minutes or until golden brown. I am using this for a luncheon I am having soon.I am think I should be able to make a large one and have it a ture show stopper. Will beable to pair it with a few other wonderful things. 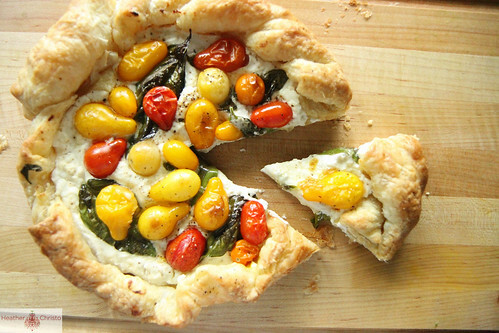 Great idea to do this instead of a Quiche- you could just add a green salad! thanks Katrina! An d really with a crostata, you could add whatever you watn to it! Incredible sounding trip! Have a wonderful and safe journey. Years and years ago I was taught to make a sort of tomato stew thing that was served over couscous. I haven’t thought of that in years. Wish I would have written down the recipe. Right now, I simply love a Dr Oz recipe; English muffin, poached egg, avocado, Swiss cheese, tomato and olive oil. Looks lucious! I see you are using Blaze (for your balsamic reduction); I brought some back from Spain. Where are you getting it here? Hi Mary!! I just got it at Trader Joes!! 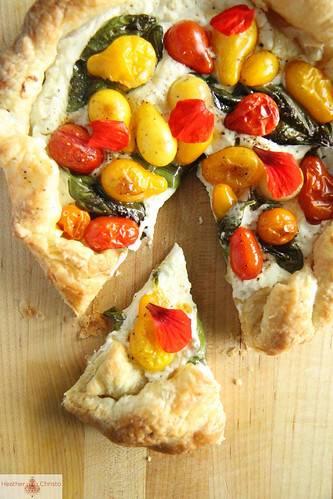 I just love tomato crostatas ~ such a pretty presentation Heather! Luscious recipe. Love the garnish of nasturtiums. Sounds like a great trip. China?!? No, way! I’m sure Pia will soak up every second of the adventure. Safe travels and I look forward to hearing about it all. I have been pondering as to what to do with a bit of ricotta hanging out in my fridge! Thank you – I will get right on this! I am that girl. i go out every morning with my dogs and have cherry tomatoes of the vine and coffee for breakfast. i know it sounds gross but it is good! This is so pretty and elegant! I’ll definately be making this soon. This looks so delicious, and reminds me of Italy so much, that I simply couldn’t not make it. Thanks for sharing – it’s safe to say you’ve created one of my dinner favourites for the weeks and months to come!